Psidium guajava , var. cujavillum (Burman) Krug and Urb. Psidium igatemyensis , Barb. Rodr. Psidium cujavillus , Burm. f.
Psidium guajava is a tropical tree or shrub. It is native to central America from Mexico to northern South America. It has been introduced to most tropical and sub-tropical locations around the world for its edible fruit. In some countries the harvesting, processing and export of the fruit forms the basis of a sizeable industry. 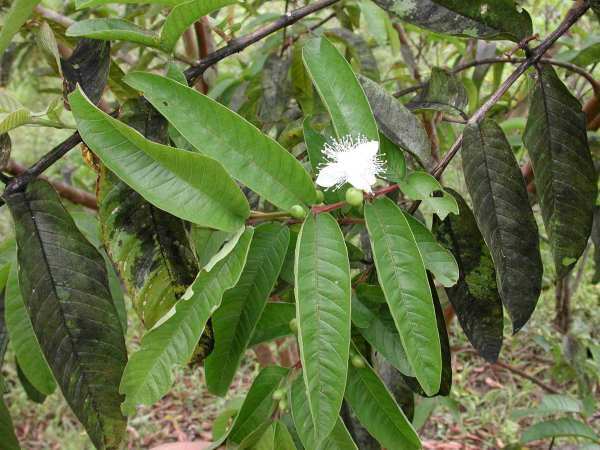 Due in part to its ability to grow on a variety of soils and across a range of climates, P. guajava has become invasive . Pastures and fields are overrun and native plants are outcompeted by this species, which has the ability to form dense thickets. This has led to its designation in many areas as a noxious weed to be controlled or eradicated. It is ranked by some authorities amongst the highest invasive categories. A major invasive species in the Galapagos Islands, Hawai‘i, New Zealand, and southern Africa (Cronk and Fuller 2001). A problem in the Marquesas (French Polynesia), New Caledonia and Fiji. Very invasive in Tonga, especially on 'Eua. Common, and in the future may well become even more widespread in the Cook Islands. Cultivated in gardens but often escaped and naturalized where introduced. The guava is said to produce more fruit in areas that have a distinct winter season, compared to tropical areas. Naturalized in Florida by 1765, it is now spreading into hammocks and pinelands, and has become dominant in the understory of some cypress stands. P. guajavais subject to a multitude of pests and diseases. In India there are over 80 insect species that will attack guava trees. The Mediterranean, Oriental, Mexican and Caribbean fruit flies cause major problems, in that they infest ripe fruit with their larvae, making them inedible. Various fungi and nematodes are also responsible for damage to trees and fruit. See Morton 1986 (http://www.hort.purdue.edu/newcrop/morton/guava.html) for detailed information. Flowers and fruits year-round. Seeds can remain viable for months, and has been reported for up to a year. Usual germination time is 2 to 3 weeks, but they can take up to 8 weeks. Trees grown from seed produce fruit in 2 to 4 years, with a life expectancy of 30 to 40 years. The fruit of the guava is highly valued and used in a number of different ways. It is very high in vitamin C, and also contains large amounts of vitamin A . The fruit can be eaten raw, but uncooked guavas are usually sliced and used in salads or desserts. The most common way of preparing the fruit is through cooking, which eliminates the strong odour. The fruit can be stewed, canned, jellied, or made into guava paste and guava cheese. Guava juice and guava nectar are popular beverages, while guava syrup can be used to flavour desserts. Dehydrated, powdered guavas can be used for the same purpose, and breakfast flakes can be made by mixing guavas with cornmeal and other ingredients. Green guavas can also be used as a source of pectin, while small and overripe fruit are utilised as a source of ascorbic acid for various foods and drinks. The leaves and bark have a high tannin content. The bark is used for tanning hides, while the leaves produce a black dye. When parasitised by the mistletoe (Psittacanthus calyculatus), the guava tree produces rosette-like malformations known as 'wood flowers'. These are sold as ornamental curiosities. The medicinal uses of the guava are many and varied. Tea made from the leaves and/or bark is known to help cure diarrhea and dysentery, as well as treat stomach upsets, vertigo and regulate menstrual periods. Trees serve as shade/shelter for livestock and are used for erosion control (MPTS Database). 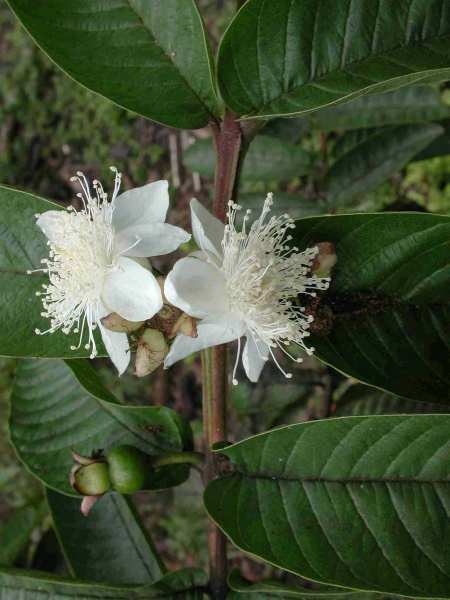 A more comprehensive list of uses for guava can be found in the Rainforest Plant Database and in the Traditional Medicinal Plants of Samoa on-line database (http://www.dittmar.dusnet.de/english/suche-e.php?term=Psidium). Grows in both humid and dry climates. Lives at altitudes from 0 to 2740 m. (MPTS database). Drought-tolerant, but prefers annual rainfall between 1000-20000mm (Samson 1986) although rainfall to 5000mm tolerated. (CONABIO 2003). Indiscriminate as to soil type. Grows well on heavy clay, marl, light sand, gravel bars or limestone ranging from pH 4.5-9.4 (CONABIO 2003, Morton 1987). Is salt-tolerant to a certain degree. Tolerates wet areas, but prefers locations with good drainage. Trees die back if summer temperatures average less than 15°C, and they are also intolerant of intense daytime heat. Survives only light frost (Yadava 1996). Prefers full sun but will grow in semi-shade. 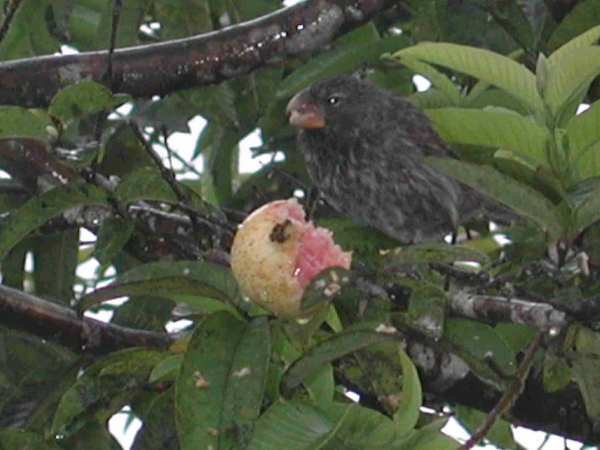 The seeds are dispersed by frugivorous birds as well as monkeys, rats and feral pigs. Honeybees (Apis mellifera) are the chief pollinators. 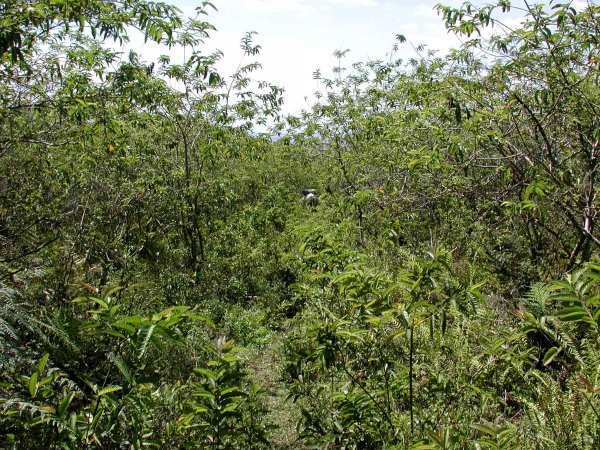 In the Galapagos, cattle and giant tortoises disperse seeds and feral pigs promote invasion into National Park areas. The average winter crop for a guava tree in India is around 450 fruits per tree, but grafted or layered trees have been reported to have produced up to 2000 fruits amounting to about 300kg. In Colombia, wild trees were estimated to bear around 40kgs of fruit each per year. Introduced to many locations as a fruit tree.Sold as a fruit tree for home gardeners. Review: Scott Henderson (Charles Darwin Research Station, Galapagos Islands). 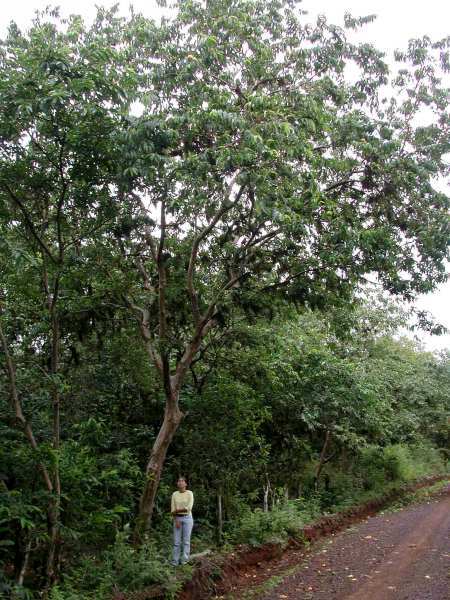 Recommended citation: Global Invasive Species Database (2019) Species profile: Psidium guajava. Downloaded from http://www.iucngisd.org/gisd/species.php?sc=211 on 21-04-2019. Invades disturbed, and to a lesser degree undisturbed, sites and forms dense thickets. Its adaptability makes it a serious weed in many tropical areas. There is the potential for this species to be a seed contaminant. Preventative measures: A Risk Assessment of \r\r\nPsidium guajava for Hawai‘i and other Pacific islands was prepared by Dr. Curtis Daehler (UH Botany) with funding from the Kaulunani Urban Forestry Program and US Forest Service. The alien plant screening system is derived from Pheloung et al. (1999) with minor modifications for use in Pacific islands (Daehler et al. 2004. The result is a score of 21 and a recommendation of: \"Likely to cause significant ecological or economic harm in Hawai‘i and on other Pacific Islands as determined by a high WRA score, which is based on published sources describing species biology and behaviour in Hawai‘i and/or other parts of the world.\"
Physical: Extensive stands of young trees can be controlled through burning, as cutting results in regrowth with multiple stems (Morton 1987). On the other hand, in the Galapagos, burning, manual cutting and even bulldozing have resulted in exacerbated invasion. Regeneration from underground parts by suckering limits the effectiveness of manual control (Cronk and Fuller 2001). 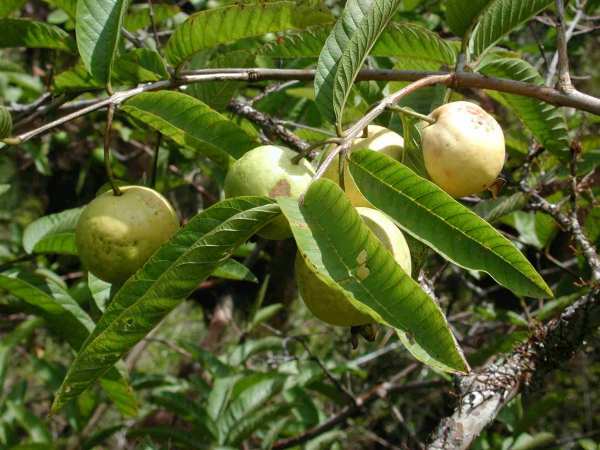 Chemical: Guava is sensitive to foliar applications of triclopyr, dicamba and 2,4-D at 1 lb/acre, and to cut surface applications of concentrates of these herbicides; very sensitive to basal bark treatments of triclopyr ester and 2,4-D ester at 2% and 4% respectively, in diesel or crop oil; very sensitive to soil-applied tebuthiuron at 2 lb/acre. Very sensitive to very-low volume basal bark applications of 20% triclopyr ester product in oil. 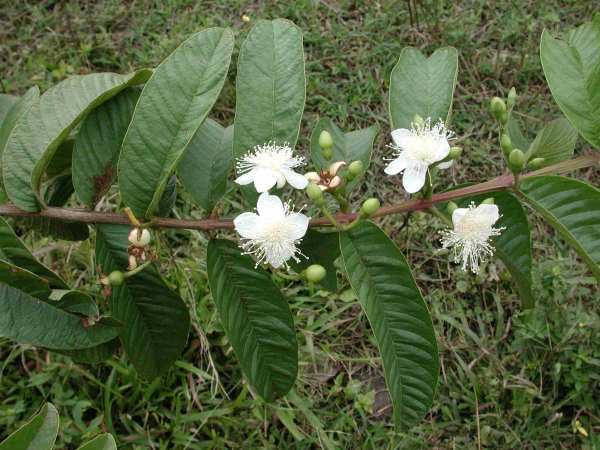 A small-leafed shrubby form of guava appears to be tolerant of foliar applied herbicides but sensitive to tebuthiuron (PIER). Biological: Goats and sheep can be used for control, as they graze leaves and strip the bark. Goats have been successfully used in Hawai‘i. Informations on Psidium guajava has been recorded for the following locations. Click on the name for additional informations. Florence J. Chevillotte H. Ollier C.& Meyer J.-Y. 2007. Psidium guajava Base de donn�es botaniques Nadeaud de l Herbier de la Polyn�sie fran�aise (PAP).